Each week, your favorite local game store brings in the newest games and supplements offered through the distribution channels. For many of you, this may feel like a magical event, when the game fairy delivers the latest and greatest new entertainment. Behind the shelves, however, a wide network of creators and publishers, fulfillment specialists, distributors, and retailers work together through a months-long process in which these games are announced, pre-ordered, and delivered. We have often encouraged you to pre-order games at your favorite store, and we frequently provide pre-order forms that you can print and hand to your local retailer. These pre-orders are crucial, not just because they guarantee that you get the games you want, but also because they demonstrate to retailers that there's demand for those games. "When a person pre-orders a game at my store, we also order one for the shelf. If 5 get pre-ordered, we get 5 for the shelf. "When 0 get pre-ordered, we usually order 0 for the shelf." 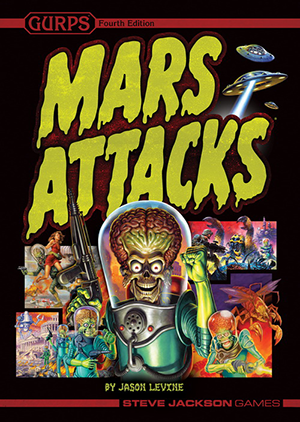 A case in point: Over the last month, two new titles – GURPS Mars Attacks and the Discworld Sourcebook and Roleplaying Game – were reportedly difficult to find in stores. What happened? A lack of significant pre-orders for the two books – both at the gamer and retailer levels – meant that the distribution channel didn't bring in enough books. Some stores ordered zero copies for their shelves. With no copies for sale at these stores, some of you thought the books were not yet available. The lesson is clear: Pre-orders are vital to get the games you want and to guarantee that those same games land on store shelves where others may find them. (You want people to play with, right?) In today's crowded gaming market – dozens of new titles are released every week – pre-orders are more important than ever. So we are asking all of you to visit your favorite local game store today and pre-order any of our upcoming titles that interest you. Your retailer will thank you for the information, and we thank you for keeping Steve Jackson Games on your local retailer's mind.